How Disposable is Your Money? I was scrapping the food left on the dinner plates into the trash the other night when I started to think about all the money I was throwing away. Not that there was a lot of food left (I use measuring cups to measure out the food, so I know approximately how much to give my kids so that they eat it all), but there was enough left that we weren’t able to stick the plates into the dishwasher as is. And of course there’s always water or milk left unfinished in the cups, or maybe only half a serving left in the pot. Then I started to think about all the other ways that I throw money away. There are, of course, all the disposable items I buy… which aren’t actually that many, in fact, as I use cloth for everything but things that touch bottoms. The leftovers left unfinished. The McDonalds bought instead of a home-cooked meal… The clothes tossed because of a stain. You can take things even further. There is the light left on in an empty room, the water left running while teeth are being brushed or the extra long shower, and the windows left open for fresh air while the heat is on. I think that each time I’m tempted to throw something away, I’m going to ask myself how much it cost me. Then I’ll see if there isn’t a way to make it work as something else. Because, while I certainly don’t mind disposable diapers, I don’t want to have disposable money. How disposable is your money? How do you reuse it? Great post! 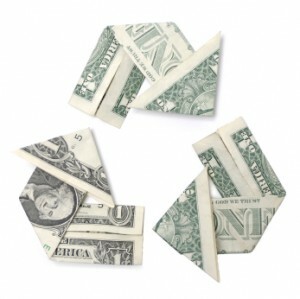 It might be fun to do a "disposable audit" for a day or two to see how much I am spending on items that could be reused. . .
.-= Amy Reads Good Books´s last blog ..Shelf Discovery =-. Similar to a 'no-spend' day- good idea! I do alot of those things too. Especially the leftovers in the trash. That is almost every night. I'm so embarassed! I really need to smarten up and save my money by not doing the things you listed. Someone mentioned on the Almost Frugal Facebook page feed that leftovers should go into the compost. I don't have a compost pile set up in the new apartment, but it's true that most leftovers (not meat or grease) can be composted. Another good solution is to make leftovers part of your pets' meals… not so good for my picky cats however! I think I'm going to concentrate more on feeding them to my husband ;). On a similar note, I try to look at purchases as a share of time. For instance, if my husband makes, say $10 an hour, and I spend $20, then I am spending 2 hours of my husband's life. Do I want this enough to make my honey work 2 hours for it? It puts things in perspective. Ah, yes- the true meaning of time=money. It puts value into perspective, doesn't it? There are so many ways we can keep from wasting. I have purchased a few more thrift store hand towels as I like to change them frequently and I have made the decision to use paper towels for my business only. I use them to clean sticky labels off vintage ironstone and then clean w/ window cleaner. I haven't figured out how to get rid of the sticky stuff w/o ruining towels or using paper. We generally have few leftovers as my good husband takes them to work, but I still find bad food in the refrigerator and it makes me so mad at myself as I run all day and do fast food way too much. I am going to purchase a lunchbox to take in the car with a lunch for myself like I did when I had kids at home. That will mean I'm eating healthier and I won't waste so much food. I like the lunchbox in the car concept! I usually keep granola bars and applesauce pouches in the car so the kids don't get too whiney (or myself even)! The original poster may never see this, I'm afraid, but if she will rub a little salad oil (or any oil, pretty much) on the label and let it rest for a while, most labels will come off easily or easier, at least. If the label has a highly finished surface you might have to rub oil in more than once to get it to penetrate. I always make sure the things I buy are cost effective. This is especially true for clothing. If you buy that $50 shirt instead of the $20 one, am I going to get 60% more use out of it? Sometimes the answer is yes (better quality, or more stylish), but many times it isn't any better! This is a little harder for me to translate at the dinner table though, often times the more expensive items are the most delicious and I have trouble looking at just the dollars and cents when emotion plays a big roll. I try to be very mindful about not wasting. Sometimes it just can't be avoided but it's the when I could have done more to avoid it that it bothers me the most. You are absolutely right that we should think about what we are wasting. Just don't think that eating up the leftovers is necessary. It looks better in the trash can than on your waist! I was taken aback one day when realized I had spent more than my hubby makes in a day during a major stockup trip to the grocery store and Target on the same day. Granted, I don’t do that more than a couple times a year but it’s scary when you do!